According to the international charity Water Aid, one in eight human beings, mostly in the developing world, goes without clean, safe water. Every 20 seconds, one child dies from diarrhea caused by contaminated water and poor sanitation. In wealthier countries, illness and death from water contamination are far rarer because of wide-scale, mostly government-operated water purification systems. Although these water treatment systems vary, many safeguard public health through an eight-step purification process. 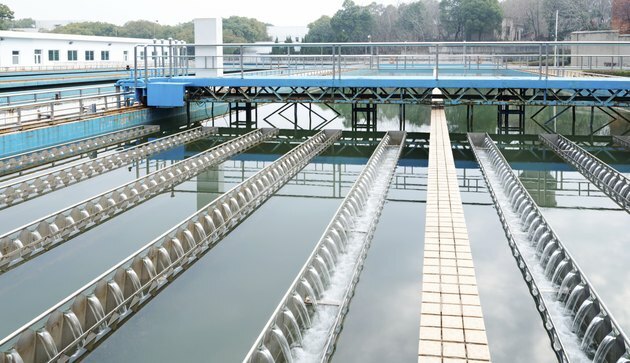 Pumps bring “raw" or untreated water, often from lakes or rivers, into the purification plant through screens that exclude fish, weeds, branches and large pieces of debris. Screening may not be necessary for groundwater. The plant may aerate the water at this point to increase the oxygen content and thus help remove problematic odors and tastes. The purpose of these two steps is to clear water of the small particles that cause it to be turbid or cloudy. Turbidity renders the water hard to disinfect. The water is rapidly agitated to disperse coagulant chemicals throughout it. The small particles, including many bacteria, begin to form large clumps called flocs or floccules. In flocculation, the water is mixed gently so that these clumps combine and precipitate out further. The water and flocs are pumped into sedimentation basins. Here, the flocs settle beneath the water so that they can be removed. About 85 to 90 percent of the suspended particles responsible for turbidity are removed at this point, including large amounts, but not all, of the bacteria. In filtration, the water flows through a multilayer medium such as quartz sand, activated carbon or anthracite coal in order to remove up to 99.5 percent of the solid materials remaining in it, whether flocs, microbes or minerals. This step usually is the last one in the process of removing solids from the water. Disinfection kills off disease-bearing organisms in the water. Most water treatment plants use chemicals, generally chlorine compounds, as disinfectants. Although chlorine is still one of the most common disinfectants, ultraviolet radiation and ozone gas are becoming more widespread. Chlorine is increasing in cost and has some known toxic effects on humans and fish. In addition, some disease-carrying microbes like Giardia and Cryptosporidium resist chlorine. The pH of the water is adjusted so that it neither corrodes nor deposits too much scale in pipes. Excessive amounts of scale can disrupt plumbing systems, but small quantities help pipes to function at their best. However, no amount of corrosion in the water distribution system is desirable. As well as causing leaks and other damage, corrosion releases pipe metals like lead and copper that jeopardize human health. Unpleasant tastes and odors remaining in the water, such as those from algae, often do not pose any health hazards. Yet consumers prefer to do without them. So water purification plants often remove tastes and odors through additional chemical treatment, ozonation or filtration. At this stage, some municipalities also require the addition of fluoride to the water for dental health.